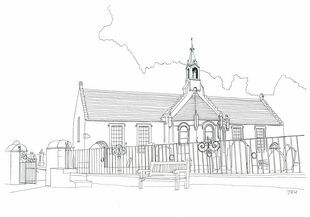 The present church, built in 1640, replaced the historic ‘St Mary’s of the Lowes’ or ‘The Forest Kirk’, dating from the 12th century, on the hillside above St Mary’s Loch. Sir Walter Scott and James Hogg, ‘The Ettrick Shepherd’, were regular worshippers. With a traditional T-plan, it was considerably adapted and improved over the years. It was gutted by fire in 1922 but restored. Memorial windows by Douglas Strachan. Sundial on corner of building.